Mayer is joined by Barbara, for a conversation with Dave Isay, Founder and President of StoryCorps, about the role of memory in the creative process. The conversation will also explore how nearly forty years of father and daughter interviews resulted in the exhibition They Called Me Mayer July. In May 2009, The Jewish Museum is partnering with StoryCorps to record interviews at the StoryCorps Recording Booth in Lower Manhattan. For more information, please contact 212-423-3240. 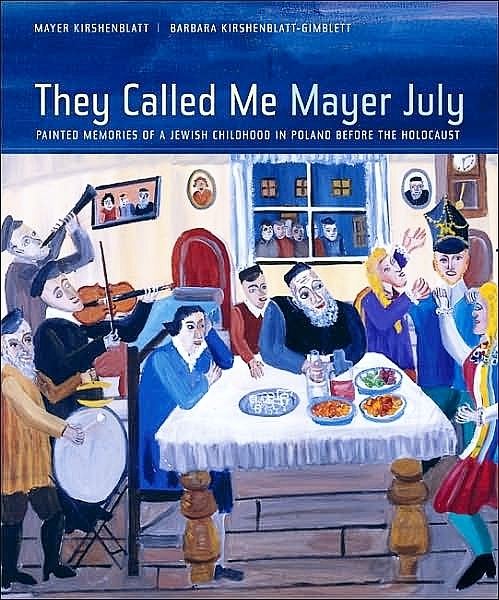 We are delighted that They Called Me Mayer July will appear in Polish. The Museum of the History of Polish Jews (Warsaw) bought the translation rights. The Polish translation should appear by the end of 2011. Barbara will make an illustrated presentation about the Museum of the History of Polish Jews on Wednesday May 6, 6:30 pm at Temple Emanu-El, One East 65th Street, NYC. The Museum of the History of Polish Jews is dedicated to presenting a millenium of the history and civilization of Polish Jews in the very place where they lived and died. Barbara is head of the international core exhibition planning team and will present recent developments in the creation of the Museum's innovative multimedia narrative exhibition. Painted Memories of a Jewish Childhood in Poland Before the Holocaust, with Mayer Kirshenblatt and Barbara Kirshenblatt-Gimblett. Father, now 92 years old, and daughter will converse informally on stage beneath large projected images of Mayer’s paintings. This family collaboration—a moving blend of memoir, oral history and artistic interpretation—is at once a labor of love, a tribute to a distinctive imagination, and an enduring representation of a lost way of life. They are in Montreal to receive to receive the J.I. Segal Award for their book on Tuesday November 11. One of the highlights of our visit to Montreal was the chance to see Mayer's childhood friend Joe Somberg, whom he had not seen for many years. Tuesday, November 11, 2008 at 7:30 p.m.
"There were also several social events, the most fulfilling of which was the Daniel Crowley Memorial Storytelling Concert and book signing presented a unique experience of doing and viewing folklore at the same time. 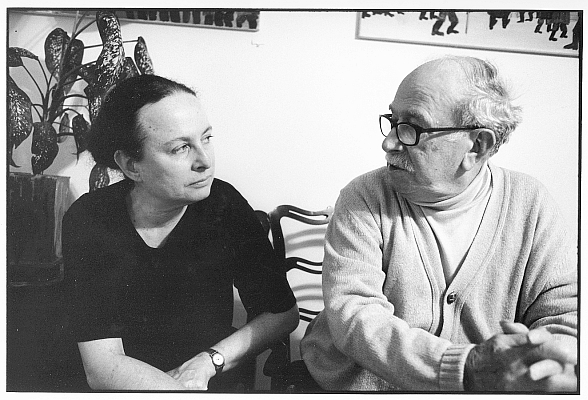 Barbara Kirshenblatt-Gimblett interviewed her father Mayer Kirshenblatt on stage, presenting the auditorium a book with his memory drawings from Poland before the Holocaust. This academic interview and simultaneous storytelling event, embodying the essence of “listening with love”, at times claimed to be the definition of folklore studies." "News in Brief," Folklore [Estonia] 38 (2007): 151. 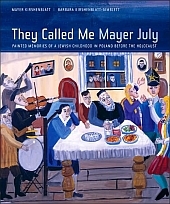 Join us as Mayer Kirshenblatt draws from his award-winning book They Called Me Mayer July: Painted Memories of a Jewish Childhood in Poland before the Holocaust . Since teaching himself to paint almost 20 years ago, Mayer has made it his mission to remember the world of his childhood in living colour - "lest future generations know more about how Jews died than how they lived." Mayer will share some of his humorous and refreshingly candid stories as well as slides of his beautiful folk art paintings recording life in Apt, Poland in the 1920s and 30s. Mayer Kirshenblatt was born in the shtetl of Opatow, Poland in 1916 and spent the formative years of his life there before emigrating to Canada in 1934. Kirshenblatt made his home in Toronto and a career as a house painter and furniture restorer. He raised a family and put the world of his childhood behind him. Reluctant for decades to share much of his past, on the occasion of his 50th wedding anniversary in 1990 he relented to his family’s requests that he “paint” his memories. With no prior experience as an artist, at the age of 73 Kirshenblatt taught himself to paint and began spilling his vivid childhood recollections onto what has now grown to a collection of over 270 canvasses. Each of Kirshenblatt’s paintings tells a story, and together they recreate in living color the bygone world of pre-war Polish-Jewish shtetl life. Kirshenblatt’s work has been exhibited at museums and festival worldwide, and with his daughter NYU professor Barbara Kirshenblatt-Gimblett has released a stunning book featuring over 200 images of his paintings, woven together with a rich narrative of historical background and contextual remembrances from the artist. Since learning to paint at 73, Mayer Kirshenblatt's mission for nearly two decades has been to record the vibrant lost world of his childhood in Poland. KRAKOW, Poland (JTA) -- When Mayer Kirshenblatt was born, the town of Opatow in south-central Poland was known to most of its inhabitants as "Apt." That's because most of the population was Jewish, and Apt was Opatow's name in Yiddish. The Holocaust left Yiddish Apt a distant memory, glimpsed dimly in sepia-tinted photographs or locked up in the hearts of the few people still alive who had known it before the destruction. Kirshenblatt was one of them until 1990 when, at the age of 73, he taught himself to paint and began to record in colorful detail the vibrant lost world of his childhood hometown. The Museum of the History of Polish Jews, Opatów District Office, and Geodesic Museum invite you to the opening of Old Opatów, an exhibition of Mayer's paintings. Featured are beautiful digital prints of 50 paintings. We head from Opatów to the Krakow Jewish Culture Festival on Monday June 30. Mayer and Barbara will give a powerpoint talk at 2:00 (Kupa Synagogue). Barbara will lecture on Jewish food and cookbooks on Tuesday and Wednesday at 2:00 (Kupa synagogue), Friday at noon on the Museum of the History of Polish Jews at the Galicia Museum. We will also do a book presentation on Saturday at 2:00 (Galicia Museum). 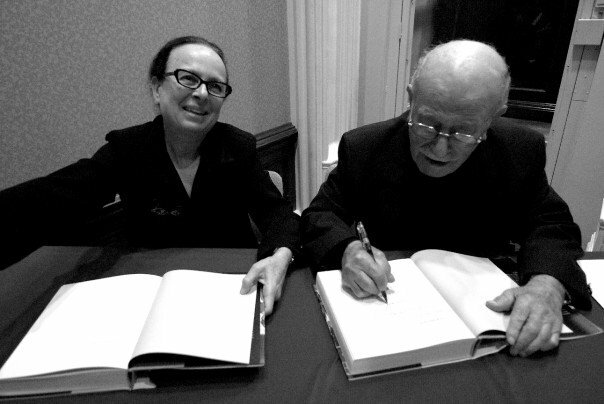 Lovely book launch at The Jewish Museum. Here are the photos thanks to Katka Reszke.